To experience the power of compassion, we access and embrace humanness, both our own and that of others. I know you've heard the saying, "Walk a mile in my shoes..." Well, the second you put yourself in someone else's shoes, you begin to connect to the heart of the matter, and therein lies innate compassion. By choosing to feel our own vulnerability, we can then accommodate the vulnerability of another. By putting compassion first, you actually regulate the reactions that historically have triggered upsetting emotional responses. You can re-wire your impulses. The next time you become aware that you are emotionally triggered by someone's unskillful behavior, immediately visualize a crying child. Bring a lost, lonely child to mind. If the image of a lost child or the little crying child instantly connects you to your heart, then commit it to memory. If neither of these images does it for you, then find a "heart connecting" visual that will. You can manage yourself in the heat of any intense moment by shifting your focus to a broken-hearted child. It doesn't matter whether the child you see is a boy or a girl. Whichever connects you to your heart is the one you will use to regulate yourself. When you focus upon a mental image of a child in pain, you will find that no matter how upset you were a moment ago about whatever happened... now, it just doesn't have any impact. You'll find yourself literally laying it down, as you embrace the heart of the matter. 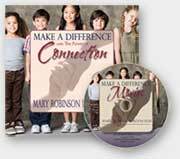 Our purpose in life is to make a difference. Compassion doesn't solve problems. It gets you into the best frame of mind and heart to reach beyond where you've gone before. It allows you to find new, creative, peaceful and healing solutions. Kindness is nice, but compassion gets the job done! to live inside somebody else's skin.